Apparently Mario liked sculpting musicians. This mandolin player was a creation of Mario Airomi as well. I imagine that he witnessed this scene and others that he created during his time in Florence Italy. A mandolin is a stringed musical instrument in the lute family and is usually plucked with a plectrum or "pick". The one scuplted is the most common with four courses of doubled metal strings tuned in unison (8 strings). There are five (10 strings) and six (12 strings) mandolins as well. It is the soprano member of a family that includes the mandola, octave mandolin, mandocello and mandobass. 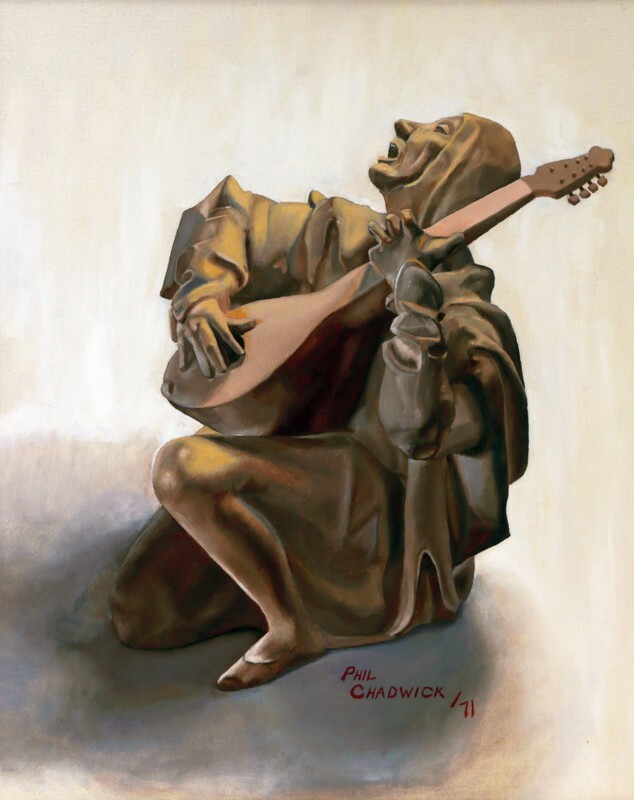 Apparently popular Italian mandolin players travelled through Europe teaching and giving concerts and some certainly visited Florence the capital of Italy's Tuscany region and the home to many masterpieces of Renaissance art and architecture. It was my fourth oil painting and I was still practicing. There are many colours and tones even in something that looks monochromatic. I was still learning. I was 17 and was in Grade Twelve at the Brockville Collegiate and Vocational School - BCIVS. On the side I was cutting grass all around Brockville and wearing out the lawn mowers that my Dad purchased. I had ten to fifteen clients and the grass business growing and kept me going. This musician was painted from a sculpture created by Mario Airomi. It was my very first oil painting. He felt it was time to move on from charcoal sticks and paper. Mario laughingly chided me for counting the folds in the accordion. They are painted exactly as I saw them. My painting has the exact same number as the original. I would ride my bike along the Kings Highway east of Brockville in order to arrive near 9 am. The door to Mario and Lily's cottage would be open and I would quietly go in and leave my shoes by the door. The spot were I painted was to the right as you went through their bedroom and into the studio. Their home was small and every room served multiple purposes. I painted in the corner beside the larger arch that led into a storage area for art and then into the sun room where Mario painted. My routine was to locate the sculpture and place it on a small table to the right of the easel that Mario had out for me. There was a light to shine on the subject matter. I would mix up some paint and spend the next two hours working on a square inch of canvas trying to get it right. That is when you really learn how to mix and match colours. For me it was a slow process but every minute was a learning experience. Mario would stroll by and offer suggestions. There were other kids there as well but we all had our own work to do and there was not much talking. At the time I did not realize how fortunate I was to be quietly taught classically by a master. I would have just turned 14 and was in Grade Eleven at the Brockville Collegiate and Vocational School. - BCIVS. This was Mr Byrn's barn on Howe Island, Ontario looking southeast in the mid afternoon one day in late September 1981. Notice the Hereford in front has a fairly large calf still nursing. This painting is mated with #0111 "The Byrn's Homestead" which has Mr Byrn's cat in it. I would have painted this in the Millwoods condo in Edmonton while learning about the meteorology of Alberta. #0091 "Cabin in the Clearing"
This is an abandoned pioneer log cabin on Newboro Lake Road near Crosby, Ontario as seen in the summer of 1979. Someone worked very hard with very simple tools to make this structure a home. I am not sure if it is still there but will make a point of looking for it. An important aspect of art is to record everyday life as it exists for posterity. Things and activities that form the mosaic of life that are common in one generation may become extinct for the next. If you paint something that is already on the verge of disappearing this important cataloguing of life becomes even more obvious. For a while I did just that and searched out history that still existed and preserved it on canvas. The pioneering way of life of living on and with the land is gone. For a while I was disguising the date when a painting was completed. People only seemed interested in the most recent painting. If a work was dated then it soon became old stuff. 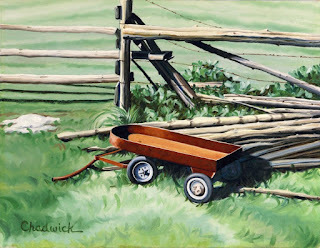 If a painting was not dated then it could always be fresh off the easel. Crazy. I stopped doing this silliness very quickly. It really does not or should not matter when or where a painting was completed. A work of art either works and sings to you or it does not. Time and space are relative. I discovered that I really am dyslexic and as I get older it might be getting worse which is actually good for my art. This was a very foggy summers day at Bayswater, Nova Scotia very near to Hubbards during the spring of 1979.The coastal waters would have still been very cold and almost any warm air mass would have been moist enough to have a dew point exceeding that chilly temperature by three degrees Celsius. The rocky outcrops of Bayswater were littered with the shells of countless crustaceans dropped by the gulls. The birds are clever enough to know just how high they must take their meals so that the drop with the sudden stop on the rock would be enough to break them open. I rarely paint with a palette knife but this is the exception. I would have painted this in the guest bedroom of the condo in Mill Woods, Edmonton Alberta. We had moved from Nova Scotia so that I could pursue the Masters of Meteorology Program with some of the very well respected professors at the University of Alberta. From the summer of 1967... a lifetime ago. This is my very first charcoal drawing with Mario Airomi. It was a glass goat that he had on his shelf. On my first day, my parents just wanted me to draw and get Mario's honest opinion if I should bother coming back the next Saturday morning. The lessons were two dollars for two hours from 9 am to 11 am more or less. Dad was doing some work on the one room cottage of Lilly and Mario and that is how I first started to take art lessons. I would continue painting with Mario until he passed on in1976. It got so he just wanted me to come to paint whenever I wanted. He called me Pheeel. He confided to my parents that I was his favourite pupil. I was in Grade 7 and still stuttering along. Mario was my friend and mentor and I was incredibly fortunate to have this master from Florence Italy start me on my way.. This sketch is numbered as zero and I suppose it is the starting place for my artistic journey. I had drawn and sketched from when I could hold a pencil but to my knowledge none of that has survived. I had not actually taken a step yet but was about to under Mario's guidance. One starts with charcoal on paper and learn the meaning of value. Colour was still in the distant future. On the back of the paper is a faint charcoal drawing of person from the nose down to the chest. Nothing is ever wasted and apparently this paper had seen a previous life. Step number 27 on my artistic and science journey from the autumn of 1975.. 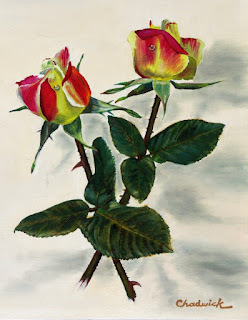 These rosebuds were for Linda in the months after we were married. My Dad always brought home flowers on Friday after work. I should have kept that practice going. Perhaps I felt that I could not contribute to the premature surmise of a something beautiful before its time. We were still both at Queens completing the fourth year of our degrees. Apparently I still made time to paint. I was interested to try to capture the way dew drops appeared on flowers. This effort was my very first attempt. Just dew it. The answer was to simply paint what you see and to remember that everything is composed merely of shapes, tones, colour and texture. If you record what you see then the image must be correct even if you might not understand the optics and rules of reflection and refraction. Nature does all of the mathematics and physics for you. It was not quantum mechanics or rocket surgery. I would apply these very same principles plus size in the analysis and diagnosis of both satellite and radar images when I was hired just a few months later by Atmospheric Environment and Services (AES). AES was later incorporated into Environment Canada. Atmospheric processes produce characteristic moisture patterns that reveal many details about the scale, intensity and impacts of the phenomena. The size, shape and sharpness of any boundary in the atmosphere further reveals the contrast between differing processes. The science of deformation zones was being born even in 1975. It occurred to me that the study of emerging observations made by both radar and satellite was the very same as my examination of how dew drops appeared on a rose. These thoughts and concepts were still blooming in 1975 but clearly art and science were the same thing. Looking back I forget where my studio was at the Van Order Drive married students apartments in Kingston. It was probably the kitchen table using my aluminum easel. I also do not recall when I found time to paint but I must have. The physics courses were certainly not trivial. From late in 1978... my goodness how the years have passed. This quiet scene was near Bayswater, Nova Scotia during fog season in June 1978. I was intrigued by the reflections, the refractions and the fog. The coastal highway was just over the hill. The tide was out but the advection fog was in. We were exploring our adopted province every chance we had. Nova Scotia was truly beautiful and unique. I was still learning lots about how the weather really worked... especially fog. This is a view along the Purcell's Cove Road just southeast of Halifax during the summer of 1977. It was a sunny day with no advection fog. I struggled with what to do with the foreground. The focus for me were the details of the rocks. I expect they are still there as we saw them on our Sunday drive. This panel started as a standard 16 by 24 inch panel but lost and inch on the bottom. The foreground was not speaking to me so it left. This looked like an abandoned lobster pot at Eastern Passage, Nova Scotia in the winter of 1978-1979. The strong winds that frequent the coast might have blown it off the nearby stack of lobster traps. Things like that happen when there is a lot of weather. However I had carefully lifted this lobster pot from the stack beside the fishing hut. I did not wish to paint a thousand lobster traps. After taking a few pictures I placed it back on top. A fisherman was parked in his idling pick-up truck just down the lane and watched me carefully as I examined it. I think he was afraid that I intended to steal it. I only wanted to look at it. This painting was the result. This is another look at the same lobster pot that I painted in #0065 "Abandoned in the Snow". The lighting and orientation are very different. I rarely if ever paint the same thing twice. 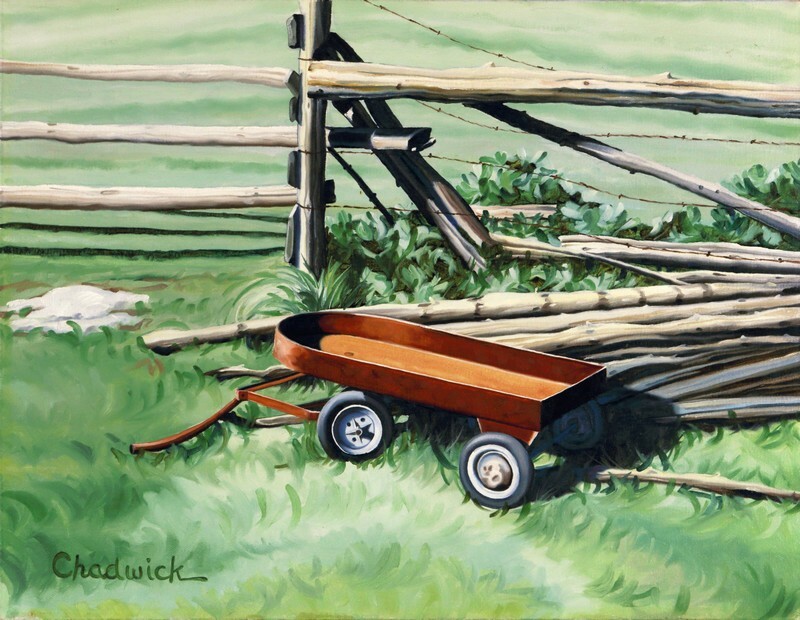 I would have painted this in the guest bedroom on the southwest corner of our apartment in the Woodlawn Mall area of Dartmouth, Nova Scotia. That studio was in the process of being turned into a nursery. This is step number 60 on my artistic journey from he winter of 1977-1978. This would have been painted in the guest bedroom of our apartment at Woodlawn Mall in Dartmouth Nova Scotia between my meteorological shifts. The long-tailed duck (Clangula hyemalis) was historically known as oldsquaw for the sound of its call. It is a medium-sized sea duck. Sadly it is the only living member of its genus, Clangula. Their breeding habitat is in tundra pools and marshes but also along sea coasts and in large mountain lakes in the North Atlantic region, Alaska, northern Canada, northern Europe, and Russia. The nest is built using vegetation and is lined with down and is located on the ground near water. They are migratory and winter along the eastern and western coasts of North America, on the Great Lakes, coastal northern Europe and Asia, with stragglers to the Black Sea. Surprisingly the most important wintering area is the Baltic Sea, where a total of about 4.5 million gather. The long-tailed duck is gregarious and forms large flocks in winter and during migration. They feed by diving for mollusks, crustaceans and some small fish. Although they usually feed close to the surface long-tailed ducks can dive to depths of 60 m (200 feet). According to the Audubon Society Field Guide to North American Birds they can dive to 80 fathoms (146 meters or 480 feet). 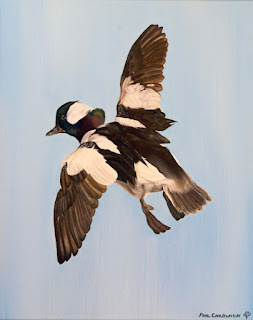 They are the only ducks that use their wings to dive, which gives them the ability to dive much deeper than other ducks. I take great pleasure in learning the nature of whatever I paint. This is were science and art really come together. The long-tailed duck is certainly a beautiful bird and I hope they out survive mankind. Did I write that out loud? Farmers need a proper and scientific measure of the probability that their crops might get wet. POP is not the answer for them. I have some ideas though. I recall an irate farmer who called to talk to a meteorologist at the Ontario Weather Centre with a suggestion on where he would like to shove 50 acres of very wet hay. It was not my forecast. I have painted this scene many times but every day is different. The weather and lighting is certainly unique for each day. I used a lot of paint on this very rough panel. It was fun on a rainy day. Yes... I do portraits... but not many. 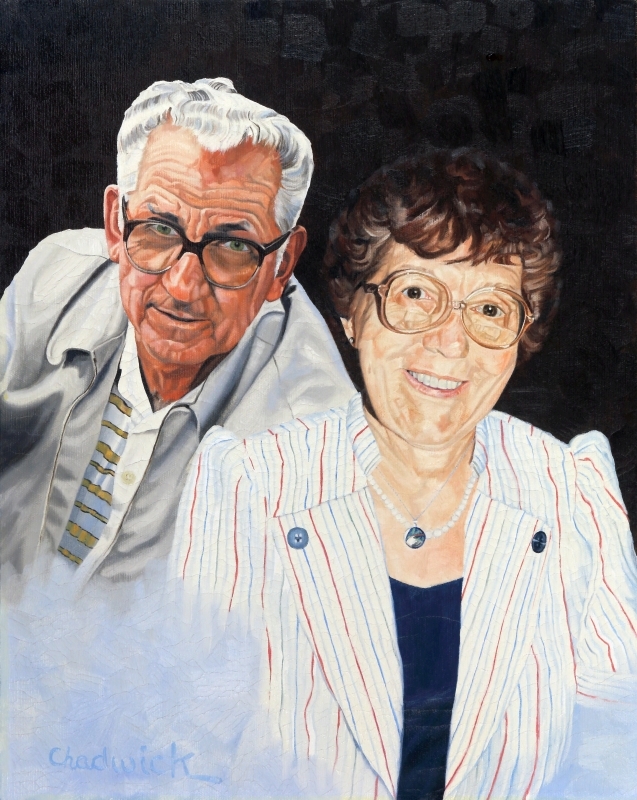 These portraits were composed from separate sittings and then married into one portrait as a surprise for their 40th Wedding Anniversary on May 4th, 1986. I am afraid that I overworked it a bit! Perfection can be over-rated. There was a lot of very subtle variations in tone and colour and I tried to capture them all. I probably should have let some of those details go. I do not attempt many portraits. This was painted in the upstairs guest room of our home on Western Avenue in Schomberg Ontario. The studio under the stairs was much too dark and lacked the proper lighting.